A general hospital in northern Vietnam has been equipping its employees to defend themselves against belligerent patients by offering martial arts classes to its entire workforce. 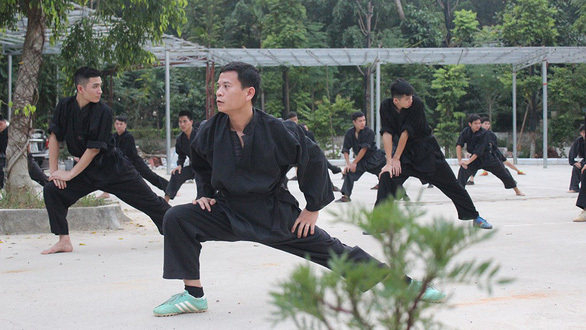 As the Vietnamese medical community struggles to recover from a series of verbal and physical assaults on doctors and medical staff at several hospitals throughout the country, Hung Vuong General Hospital in Phu Tho Province has spent the last several years taking a more proactive approach to dealing with unruly patients – offering martial arts classes to its managers and employees. Every single individual of its workforce, including doctors, nurses, physicians, technicians, and even hospital director Pham Van Hoc, are now apprentices of the local Binh Dinh Gia martial art style. The group is taught by martial arts master Nguyen The Vinh, an experienced practitioner who says the aim of his lessons are to strengthen the body, train reflexes, and teach basic hand-to-hand combats for self-defense purposes. However, as the majority of practitioners are part-timers, with most of them way beyond the age suited for any rigorous training regiment, Vinh’s approach is to let them move at their own pace. “It takes time and patience!” he shared. Occasionally, doctors are forced to leave practice sessions to attend to urgent patient needs, such as dealing with broken bones are emergency treatments. Hung Vuong General Hospital personnel have been practicing martial arts since 2012, well before Vietnam’s medical community first identified the growing trend in attacks on hospital staff. “We once had a new nurse travel with us to Hanoi for a martial practice before we could admit her to our hospital workforce,” the hospital director said. Such ‘martial art training trips’ are no longer necessary now that Hung Vuong has its own class. 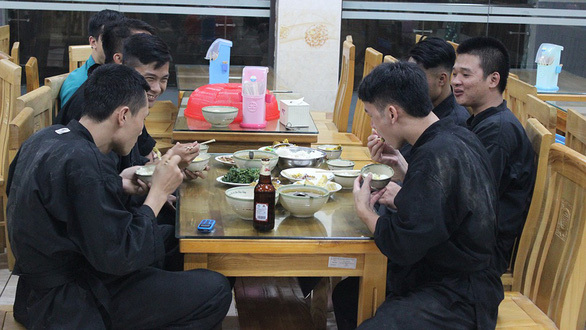 Due to the fact that the hospital is situated in a rural area with few entertainment facilities, the hospital employees originally turned to sport as a means of staff bonding. Badminton and football wound up not drawing too much enthusiasm from the group, but martial art was a hit. For the first six months of lessons, the class met seven days a week, twice a day, at 4:00 am and 5:30 pm. After the group reached acceptable levels of stamina and agility, the schedule was reduced to just Tuesday and Thursday evenings. Concurrently, the dojo focuses on counter-attacks and self-defense in its training room, just opposite the patients’ wing where just about anyone can observe doctors turned ‘martial artists’ delivering blow after blow during training sessions. “Practicing martial arts not only boosts doctors’ confidence and capabilities, but also provides them with a way to defend themselves when adverse situations arise,” Hoc said. Only 60 members of the hospital staff showed up to the first few practices, many of whom were middle-aged doctors whose joints and bones had stiffened with time. But as others began to see the benefits the classes were having on their colleagues, they began to join. Now, the class has more than doubled in size, to 135 dedicated students. Besides the traditional Binh Dinh Gia martial style, learners also take kickboxing and muay Thai courses. “Most of us could not even lift our arms after the first day of training,” physician Nguyen Van Quan revealed. The health benefits of the martial arts classes have also spilled over into the daily work lives of each participant. Now, the massive associated that comes with employment at a reputable rural general hospital seems like a walk through the park. Since the practice began in 2012, the staff at Hung Vuong General Hospital has only faced one ‘near assault’. On the eve of the Lunar New Year, ambulance driver Nguyen Tai Ba left the infirmary for the emergency transport of a traffic accident victim. About 3km from the hospital, Ba got stuck in traffic when a car refused to give him the right of way. He decided to speed up and cut off the car in order to get to the hospital in time to save the man’s life. No sooner had he arrived at the hospital when the car driver approached him aggressively. Ba and another hospital staff member were able to subdue the man as he was raising his hands to attack, just in time for local police to calm the scene. The man later apologized for his reckless behavior, showing regret that the patient had perished along the way.